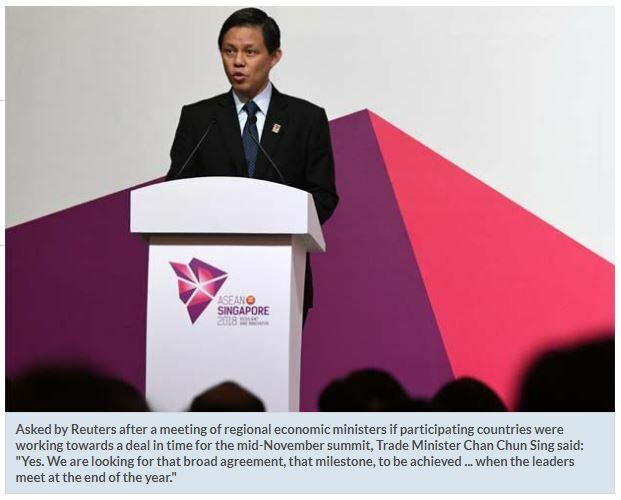 SINGAPORE: Singapore’s trade minister said on Saturday that broad agreement on the world’s biggest trade deal should be reached at a summit of leaders from participating nations in the city-state in November, six years since talks began. Called the Regional Comprehensive Economic Partnership (RCEP), the trade accord includes the 10 members of the Association of Southeast Asian Nations (ASEAN), Australia, India, Japan, South Korea, New Zealand and the world’s No.2 economy, China. The deal does not include the United States, which is locked in a trade spat with China and pulled out of another broad, international trade agreement in 2017 called the Trans-Pacific Partnership (TPP). The White House said on Friday that U.S. President Donald Trump would skip the November gathering of leaders in Singapore. However, he said it was not clear when a final deal would be signed.